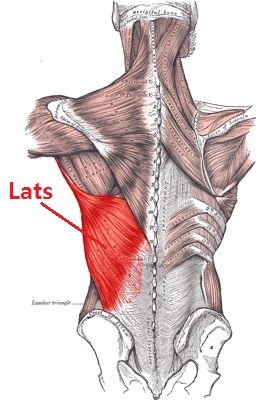 Colloquially known as the "lats" by body builders, the Latissimus dorsi is the broadest muscle in the back. The muscle is on the back (one on each side of your body) behind the arm, and is partly covered by the trapezius. Pulling weights towards your abdomen while leaning forwards. Pulling yourself off the ground using a chin up bar. Pulling a weight towards your chest while lying on your back.